February | 2011 | 50 Westerns From The 50s. I really hate posting this. 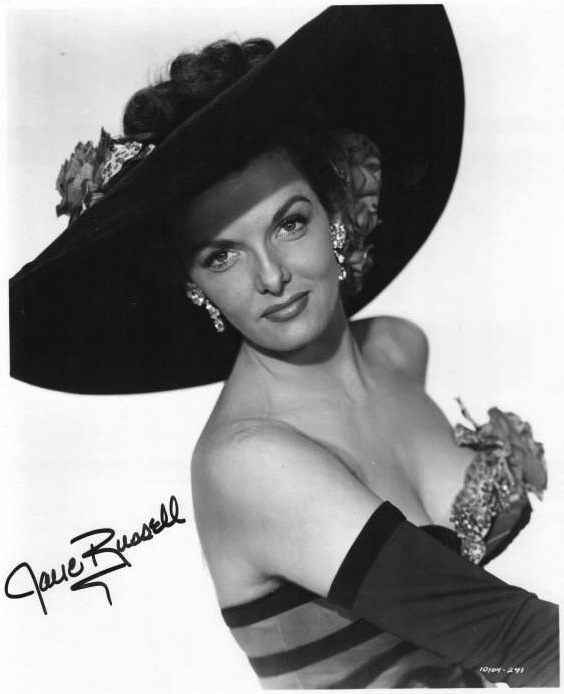 Jane Russell — Howard Hughes discovery, controversial bombshell and just all-around cool lady — has passed away at 89. Her obituary can be seen here. The photo is from one of my Top Five favorite films of all time, and one of the funniest things you’ll ever see, Son Of Paleface (1952). Sometimes it feels like this blog is turning into the Allan Dwan Fan Club — not that that’s a bad thing. 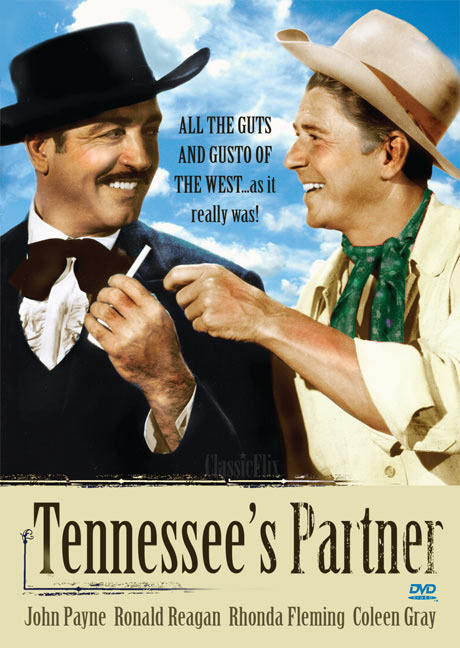 Colin from Riding The High Country tipped me off that VCI has announced a widescreen edition of Tennessee’s Partner for April release. A Superscope picture from RKO — with prints by Technicolor and starring John Payne, Ronald Reagan, Rhonda Fleming and Coleen Gray, Tennessee’s Partner looks fine in its original full-screen transfer, but was clearly shot (by the great John Alton) for widescreen exhibition. The pictures Dwan directed for producer Benedict Bogeaus range from Westerns to film noir. They’re all worth checking out. Not too long ago, VCI upgraded another Dwan Western, the terrific Silver Lode (1954). 50s Western Paperback Art, Redux. Thomas Allen, Chromogenic print, 2009. 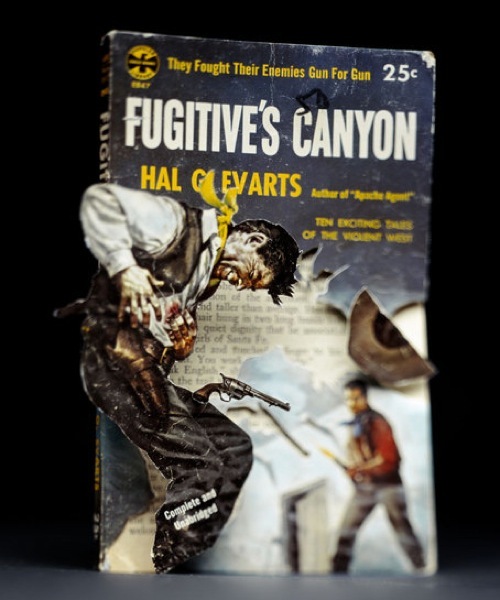 I love Thomas Allen’s photographs, which make incredible use of old pulp and paperbacks covers — even though I cringe at the thought of these things being mauled in the process. You can see a number of them, many of them Westerns, here. 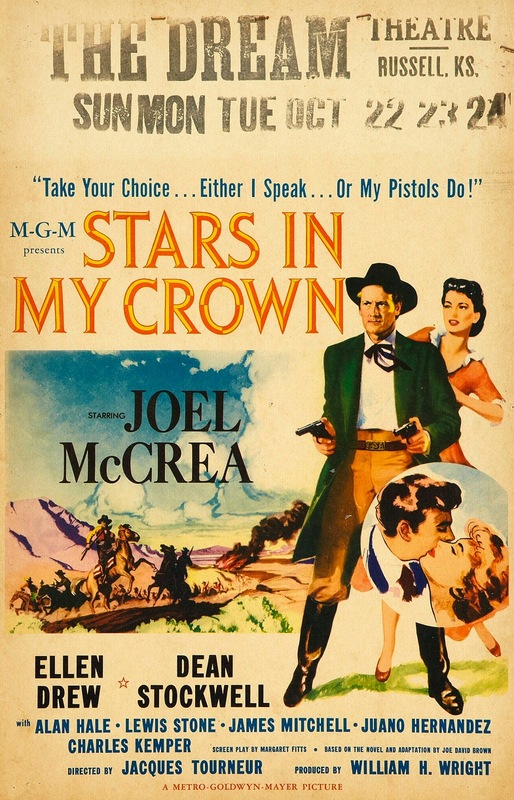 Stars In My Crown (1950) — Not really a Western, but who cares when it’s as wonderful as it is? Joel McCrea said this was his personal favorite of his films, and when you’ve appeared in films by Alfred Hitchcock, Preston Sturges, Frank Capra, Sam Peckinpah and others, that’s really saying something. I can’t recommend this picture highly enough. If I won the lottery, I’d buy you all a copy. The Outriders (1950) — McCrea again, backed by an incredible cast (Barry Sullivan, Arlene Dahl and James Whitmore), gorgeous Technicolor and the kind of gloss MGM gave its Westerns. Ambush (1950) — Robert Taylor didn’t make many Westerns, but when he did saddle up, the results were always worth checking out. If you haven’t, you really need to see Devil’s Doorway (1950) and Westward The Women (1951). Ride, Vaquero! (1953) — Taylor again, along with Anthony Quinn, Ava Gardner and Howard Keel. Wild Rovers (1971) — This falls outside the confines of this blog (and my book), but it’s a terrific film. Blake Edwards was sickened by the studio’s treatment of this film, and Warner Archive is righting that wrong by treating us to the full-length version, complete with its overture and exit music. It stars William Holden and Ryan O’Neal, and provides the underrated Joe Don Baker with one of his best roles. I hope Blake Edwards knew this was in the works when he passed away. Tim Holt Western Classics, Volume 1 — This is promised to be the first of a few collections that will eventually put all 40-plus films on our shelves. Though the post-war films are the better ones, I hope they’re organizing them in chronological order — which will make volumes 3 and 4 outstanding. I posted on Holt in Trail Guide (1952) earlier this week. Back in December, I posted a “wish list” compiled from the wants of a number of this blog’s frequenters. Stars In My Crown and Ambush made the list — along with a collection of the Tim Holt RKOs. For The Love Of Film (Noir): Film Noir And 50s Westerns. 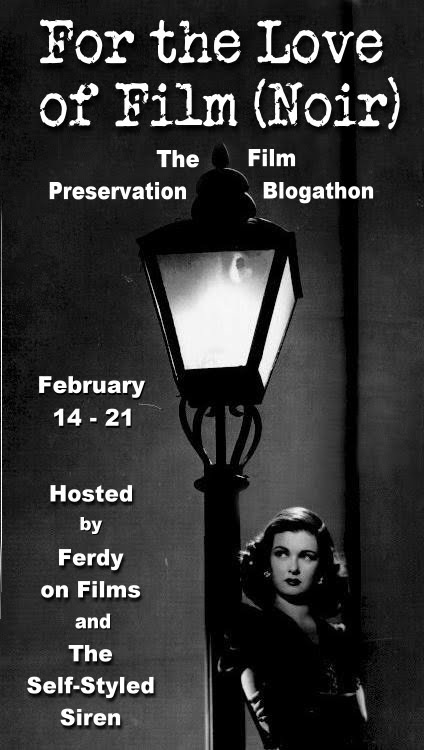 What’s a blog dedicated to 50s Westerns doing taking part in the For The Love Of Film (Noir) Blogathon? The money raised will help the Film Noir Foundation and Paramount Pictures fund UCLA’s restoration of the 1950 film noir The Sound Of Fury (also known as Try And Get Me), which means one more film that won’t be lost forever. Regardless of genre, that’s reason enough. 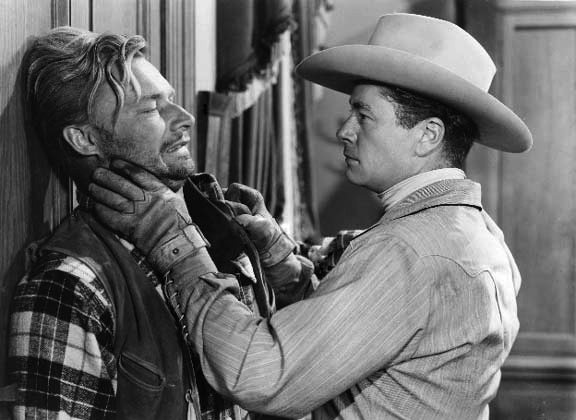 Thinking about the connection between 50s Westerns and film noir, I saw a few ways to approach it: Noir-ish Westerns, remakes and the co-mingling of personnel. From the fatalistic tone to the flawed heroes to the cranked-up violence to the brooding cinematography, almost every 50s Western shows some film noir influence. In pictures like Winchester ’73 (Anthony Mann was one of noir’s finest directors) and The Gunfighter, the influence is quite obvious. But even a Roy Rogers picture like Spoilers Of The Plains (1951) seems a little darker than the ones that came before it. It’s a shift that makes sense. Audiences had been through World War II — they knew what death looked like. They’d seen the product of the darkness people carry around inside. And they’d learned that the good-guy/bad-guy thing doesn’t correspond with the color of your Stetson. These postmodern cowboys spend as much time battling their own demons as battling the bad guys. Not only does this align them with the whole noir thing, but at the time it let them offer up something TV didn’t have. Maybe it’s a simple matter of semantics. 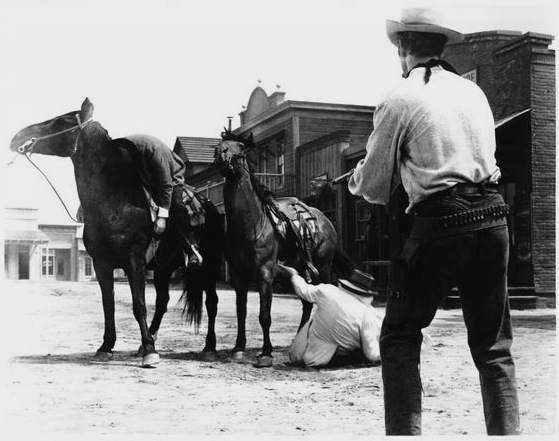 Is the Psychological Western just film noir on horseback? • The Anthony Mann/Jimmy Stewart pictures — Winchester ’73 (1950), The Naked Spur (1952) and The Man From Laramie (1955) are standouts. • Henry King’s The Gunfighter (1950) and its distant relative The Bravados (1958), both starring Gregory Peck. • Most of the cheap Westerns Lippert Pictures released in the 50s, with Little Big Horn (1951) being a good one to seek out. Someone could write a book on the Noir Westerns. And should. If nothing else, it makes a great game for film fans, arguing about which Westerns are the most noir-ish. High Sierra (1941) is a great film, with a terrific performance from Humphrey Bogart, but its Western remake Colorado Territory (1949) is even better — and certainly one of the darkest cowboy pictures ever. Raoul Walsh (who also directed High Sierra) works hard to develop characters we care about, getting incredible performances out of Joel McCrea and Virginia Mayo, only to (spoiler) gun them down like dogs. The Badlanders (1958) is a Western take on a film noir you might’ve heard of — The Asphalt Jungle (1950). It stars Alan Ladd and Ernest Borgnine, along with Anthony Caruso — who was also in Jungle. 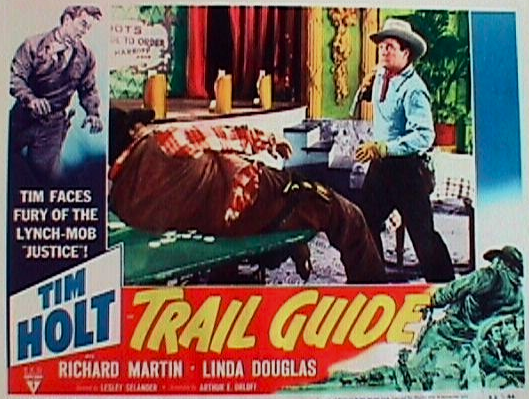 Trail Guide (1952) is one of the last of the RKO Tim Holt pictures. And while the RKO Holts rank among the best series Westerns ever made (I’d say they are the best), Trail Guide isn’t one of the better ones. RKO was tightening the budgets, and the films suffered for it. The chemistry between Tim Holt and Richard Martin and the direction of Lesley Selander go a long way, however, and even the weakest entry is the series is worthwhile. I happened to be researching the Holt pictures when the Blogathon was first announced, and I became intrigued by the ties between Trail Guide (picked more or less at random from the post-war Holts) and some of the best film noirs. Here’s some of what I came across. The cast: Any fan will tell you that character actors are usually one of the best things about any film noir or 50s Western, and Trail Guide has a supporting cast with plenty of noir credentials. Frank Wilcox’s incredible list of credits includes Out Of The Past (1947), Bunco Squad (1950) and Naked Alibi (1954). Robert Sherwood appeared in Two Dollar Bettor (1951). John Pickard’s in White Heat (1949), The Sniper (1952) and Crime Wave (1954). John Merton turns up in Parole, Inc. (1948) and The Big Heat (1953). And in 1947 alone, Kenneth MacDonald could be seen in Johnny O’Clock, Brute Force and Crossfire. These guys appeared in hundreds of films, so this crossover isn’t unexpected. As we move behind the camera, however, things get more significant. Screenplay: Writer Arthur E. Orloff provided the story for the interesting (and hard to find) narcotics caper picture Hell Bound (1957, which had the great working title Dope Ship). Cinematography: This is where the picture’s noir connection really gets interesting. Trail Guide benefits from being shot by the great Nicholas Musuraco, whose noir credits include Stranger On The Third Floor (1940), Out Of The Past, The Woman On Pier 13 (1949), Born To Be Bad (1950) and The Hitch-Hiker (1953). That’s a film noir pedigree that’d be hard to beat, and it helps explain why the RKO Holts are often praised for their gorgeous location photography. Editing: By the time he threaded Trail Guide into the Moviola, Samuel E. Beetley had cut Out Of The Past, The Big Steal (1949) and The Threat (1949). All three of these, like the RKO Holt Westerns, are marked by expert pacing. Along with revealing a surface relationship between the two genres, this exercise provides some insight into how the studio system worked. You went to work, you worked on the picture you were assigned, and when it was done, you started another one. It might be a future classic with a name cast, or maybe you’d find yourself in Lone Pine with Tim Holt. By working more or less nonstop, actors, writers, technicians and others were able to really hone their craft. And along the way, with such talent involved, the divide between A and B pictures became somewhat blurred. This Studio Era edition of Six Degrees Of Separation (actually, just one degree) applies to other genres, too. Try it sometime. You can read about most of the noirs I name-dropped by trolling the other blogathon posts. I kinda doubt any of them will bring up Trail Guide. Trail Guide isn’t a lost film. It turns up on Turner Classics every so often, looking great. 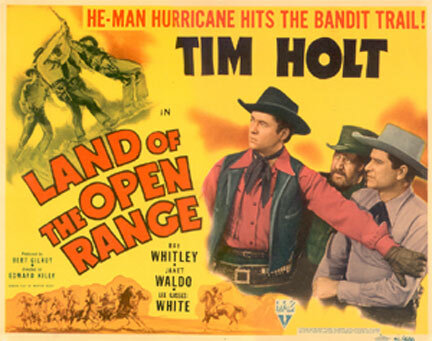 But sadly, none of the post-war Tim Holt Westerns are available on DVD. They’ve been prized by 16mm collectors for years, especially non-C&C TV prints, and they deserve the re-evaluation a DVD release would bring about. Many films aren’t as lucky, however, which is where the blogathon comes in. To find out more, head to the Self-Styled Siren and Ferdy on Films. Here are links to posts by the other blog participants, headed by the one and only Leonard Maltin. Most importantly, here’s where you can contribute. By the way, last year, I wrote about Joel McCrea and the almost-lost Stranger On Horseback (1955). 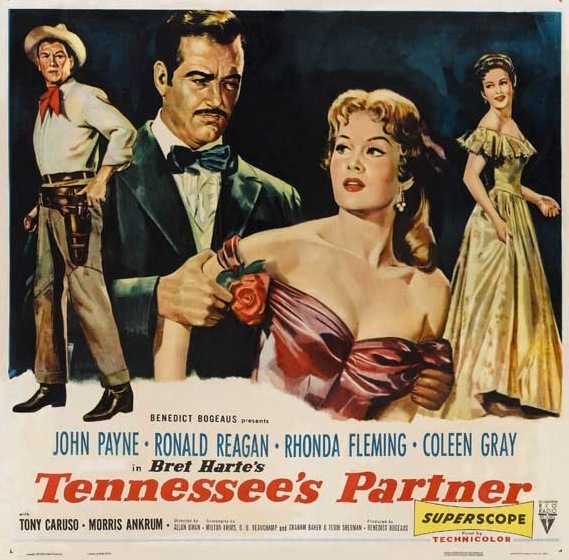 Colin over at Riding The High Country has put up a nice post on Arthur Penn’s The Left Handed Gun (1958), a film I find more interesting than good. Make that very interesting. This is one of a few 50s Westerns that sticks a juvenile delinquency story on horseback — Nicholas Ray’s The True Story Of Jesse James (1957) is another. It’s an approach that seems to work. And though Newman’s Method is a bit too, uh, Method-y at times (as Colin points out), portraying Billy and his gang as a bunch of illiterate imbeciles who come to believe the news stories about them takes the picture in a fascinating new direction. James Best, with that strange giggly laugh that’d serve him well on The Dukes Of Hazzard, makes quite an impression. Researching this book has sent me down some odd rabbit holes, and this has been one of my favorites. 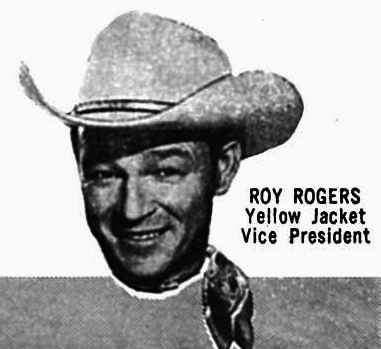 Following up on some comments from Cheryl Rogers Bennett, I’ve become fascinated by the fact that Roy Rogers was, for a time, vice president of the Yellow Jacket Boat Company. 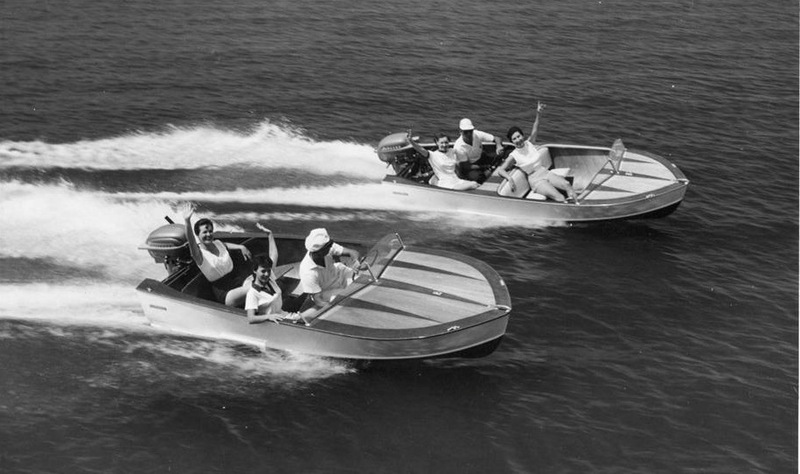 Throughout the 50s, Yellow Jacket (in Denison, Texas) offered a line of beautiful molded mahogany boats — some of which were sold through Sears. You’ll find a full history of the company here. To me, a mahogany boat from a builder like Chris-Craft is a real work of art. And I’ve always thought it’d be great to own one. Now I’ve settled on a particular model — Yellow Jacket’s Trigger Deluxe.